Young Vladika Petar I Petrovic (1782-1830) became the leader of embattled Montenegro facing enormous difficulties. Despite the difficulties he faced, he managed to become one the most popular Montenegrin leaders from the charismatic Petrovic dynasty. He was made a bishop by Mojsije Putnik in 1784. During his trip to Russia (1785), Montenegro was cowardly attacked by Turkish forces led by Mehmed Pasha Busatlija. Apart from slaughtering innocent civilians, Turkish forces helped by fifth column, burned down 1900 houses, and stole around 3800 sheeps and cattles (Jagos Jovanovic, Stvaranje Crnogorske drzave i razvoj Crnogorske nacionalnosti, 1947, Obod-Cetinje). When Vladika Petar I returned from Russia, he found his country devastated. Utter illnesses, homelessness and starvation, forced part of population to live in craves surviving only on striping the bark from trees, grass roots, and wild plants such as nettle (kozelac, pirevina, kopriva). It is believed that about 700 people died in this disaster what is large number relative to small number of population at the time(Jagos Jovanovic, Stvaranje Crnogorske drzave i razvoj Crnogorske nacionalnosti, 1947, Obod-Cetinje). Petar's I priority was to pacify Montenegrin tribes enraged in blood feuds. He managed to eradicate blood feud among many tribes though not all, using the combination of begging and cursing. 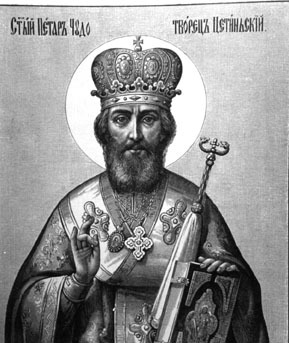 Petar I was a wise Bishop and a great spiritual and military leader. His charisma was enhanced by bravery shown in many battles where he fought with a sword in a hand along his compatriots. During his half-century rule Vladika Petar I victoriously led Montenegrins into many important battles against the Ottomans, including the battles at Martinici and Krusi in 1796. Montenegrins won both of these battles which were considered the major battles at that time. At the battle of Martinici 3000 Montenegrins defeated Mahmut Pasha Busatlija and inflicted heavy casualties to 18 000 Turkish forces (Momir M. Markovic, Crnogorski rat, Podgorica, 1993, p.122). Fearing the spread of the resistance to Turkish rule over neighboring regions Mahmut Pasha Busatlija again attacked Montenegro determined to capture Petar I and the main tribal heads. At the crucial battle at Krusi (Ljesanska nahija) the Turkish army of 30 000 led by Mahmut-Pasa Busatlija and assisted with seven French officers was defeated with heavy casualties by a force of 6 000 Montenegrins led by vladika Petar I (3 Oct. 1796). In this famous Battle Mahmut pasha was killed(Jagos Jovanovic, Stvaranje Crnogorske drzave i razvoj Crnogorske nacionalnosti, 1947, Obod-Cetinje). The biggest importance of this battle of Krusi lays in the fact that it was won by coalition of Montenegrins and Highland (Brda) tribes. Brda (Piperi and Bjelopavlici) held their tribal assembly declaring unification with Montenegro and accepting the rule of Petar I. Decision (1796) of tribes Piperi and Bjelopavlici to join Montenegro enlarged territory of Montenegro to near Spuz, river Moraca and Rovci. These victories also enhanced Montenegrin reputation among the population of the Kotor Bay, and were the beginning of the Montenegrin quest for control of the southern Adriatic coastal towns. After conquering Dubrovnik in 1806, the French Emperor Napoleon, undefeated in Europe, advanced toward the Bay of Kotor in Montenegro. Montenegrin army led by Vladika Petar I, aided by several Russian battalions and a fleet of the General Senjavin, went to war against the invading French forces and pushed them back to Cavtat and later to Dubrovnik walls. But soon after, Russian czar Alexander asked Montenegrins to relinquish control of Boka to Austria. However, after Montenegrins retreated to Herceg Novi, Alexander changed his mind again, and with a help of Montenegrins conquered Brac and Korcula. In the meantime, France encouraged Turkey to attack Russia and Russia withdrew their fleet from Adriatic to defend Ionic islands. The subsequent peace treaty between Russia and France (1807 in Tilzit) granted the control of the Kotor Bay to France. French authorities in the areas they controlled (kingdom Iliria administered from Ljubljana), set up schools, built roads and libraries and insisted on the use of national language. In addition Napoleon forbade by a decree the meddling of Roman clergy into Christian Orthodox affairs and named Benedict Kraljevic to be the Orthodox bishop (episkop) in Dalmatia and Boka. This had strong impact on the formation of national consciousness among South Slavs (Jagos Jovanovic, Stvaranje Crnogorske drzave i razvoj Crnogorske nacionalnosti, 1947, Obod-Cetinje). At the different fronts on mainland, Montenegrins had two unsuccessful battles against Turks (1807 Onogost and Klobuk). French general Mormon allied with Shkoder Pasha in order to conquer Montenegro. However, Montenegrins (particularly Kuci, Martinici and Rovci) broke his illusions by heavily defeating Turkish forces who attacked Piperi (1811). In the following 1812, Herzegovian Pasha Sulejman Skopljak attacked Drobnjaci, but was defeated with a help of Piperi, Bjelopavlici, and later Moracani and Rovci at the battle of Bukovica. In the third attempt of that year Skadar's Mustaj Pasha aided by Albanian Turks aimed to conquer Brda and than Montenegro. Petar I helped people of Brda and defeated Turks in the battle of Ljubotinj (1812) even though vladika suffered heavy wounds. The captured Turks were slatted but the captured French were exchanged for large amount of gunpowder and ammunition(Jagos Jovanovic, Stvaranje Crnogorske drzave i razvoj Crnogorske nacionalnosti, 1947, Obod-Cetinje). At the time Napoleon suffered final defeat in the the hands of Russian, Prussian, Austrian, and Swedish troops. The committee of four (Russia, Prussia, England, and Austria) on Congress of Vienna limited France back to pre-war borders (from 1792) and sent Napoleon to Elba. Prior to that, in 1813, the Montenegrin army, with ammunition support from Russia and Britain, liberated the Kotor Bay from the French. An assembly held in Dobrota (10.11.1813) resolved to unite the Bay of Kotor with the Montenegrin mainland. In addition, the new government was elected, comprised of six representatives from each region; Boka, Brda, and Montenegro. However, at the congress of Vienna, with Russian (czar Alexander I) consent, the control of the Bay was granted to Austria ("for general interest"). Needles to say, this was a big blow to Vladika Petar expectations, who thought that Montenegro would be recognized as an independent state (Jagos Jovanovic, Stvaranje Crnogorske drzave i razvoj Crnogorske nacionalnosti, 1947, Obod-Cetinje). Following this disappointment Montenegro entered very difficult times. 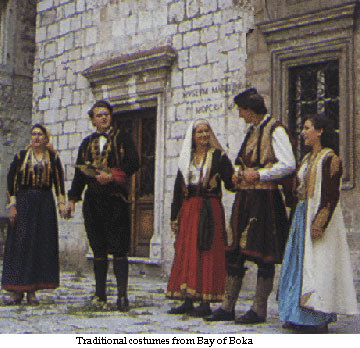 Since the Turkish markets and markets in Boka were closed, in 1816, about 2000 Montenegrins starved to death. Living in the hostile surrounding, exhausted by wars and tribal hostilities and being permanently undermined by Guvernadur Radonjic, Vladika sent 800 Montenegrins to live in Russia. In addition, in 1817, he sent 100 families from Drobnjaci to live in Serbia. Exodus to Serbia continued thereafter so that vladika panicked fearing that "there would be none to defend these tribes from Turks"(Jagos Jovanovic, Stvaranje Crnogorske drzave i razvoj Crnogorske nacionalnosti, 1947, Obod-Cetinje). In 1829, Russian tzar Petar I, appreciating Montenegrin efforts in the fight for freedom and Christendom, paid out the aid to Montenegrins amounting to 6000 Rubles. In 1798 Vladika Petar I introduced the first laws in Montenegro - Zakonik Petra I(see extract). This law was further updated with five new paragraphs at the assembly in Stanjevici (1803). His rule prepared Montenegro for the subsequent introduction of modern institutions of the state: court (called Kuluk), taxes (60 para per household annually), schools and larger commercial enterprises. He also introduced his guards (25), so called 'Perjanici', who were chosen from the most prestigious tribes. Perjanici were first police (dzandarmerija) forces in Montenegro whose duty was to arrest those facing Kuluk. Petar's I intention to implement the law and strengthen the central government was met with the resistance from the Montenegrin tribes who had always had considerable freedom and autonomy. Determined to impose the rule of law Vladika asked is guards to kill two prominent opponents of the new law. These two were the tribal heads of Komani and Cevljani. Vladika Petar I had unquestioned moral authority strengthened by his military successes. Petar's I epistles (poslanice) to people and tribes are source of permanent inspiration for human, democratic, cultural and efficient communications of a ruler with his people. 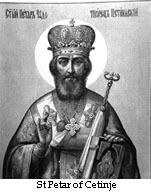 After he died, he was proclaimed for the one of four Saints of the Montenegrin Orthodox Church by his successor Petar II Petrovic Njegos. This proclamation of Petar I as St. Peter of Cetinje (Sveti Petar Cetinjski) was met by Montenegrins with the 'approval and jubilation'.